St. Joseph's Parish is growing as a result of population growth in the Kimmswick/Imperial area. There are 1200 families currently and a total of 3600 families is expected over the next 10 to 15 years. The present church seats 200 persons. The parish purchased a 15 acre tract of land on the west side of Interstate 55 to develop an entirely new parish facility there. Needs included a church, school, parish center/gymnasium, parking and athletic fields. A present home on the property will serve as a rectory. The master plan investigated all viable plans for the new site including construction cost estimates and phasing studies to assist the parish in determining which element of the plan should be constructed first. Currently the church and school portions of the project are complete. 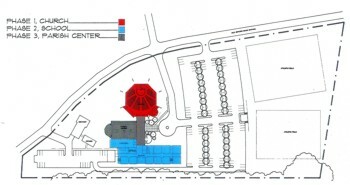 The parish center and a school expansion project are currently underway.